If you want to know how to be a funny professional speaker or how to be a comedian, then you’ll want to read on! We’re nearly ready to launch The Humor College. am willing to pay for it. of an audience, this program will be right up your alley. the errors back to us, and then get ready to learn. the instructions are clear, etc. be helping make the world a funny place. and you’re on your way to being funnier at a discount. Cheers! Good Luck! And Thanks! PS. Want to see what product you’d be helping with? https://www.bradmontgomery.com/wp-content/uploads/2018/11/logo-1-495x198-1-300x120.png 0 0 admin https://www.bradmontgomery.com/wp-content/uploads/2018/11/logo-1-495x198-1-300x120.png admin2007-09-14 23:02:182007-09-14 23:02:18Enter Contest. Get Funnier. Save $150. 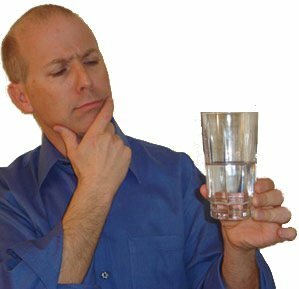 Finally, We Figure Out if the Glass is Half Full or Not? I stayed up all night, did some measurements, checked the humidity, the dew point and the rate of evaporation. Then, in the face of the pseudo science, I just decided: The glass IS half full. So, go turn that smile upside down, honey! Life is good! Need a really funny motivational speaker, keynote or seminar? Do YOU think that glass is mostly full too? Click here. One of my favorite corporate comedians or comedian speakers is Kansas City comedian Mark Mayfield. He, like me, is a motivational humorist, but got his start in comedy. And it shows on stage… he is REALLY funny. I’ve known Mark for years since we did a showcase together. He’s always been totally funny, he works totally clean, and best of all, he’s a good guy. 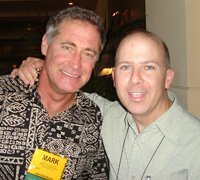 I met up with Mark at the convention for the National Speakers Association recently in San Diego, California. I love NSA conventions for a gazillion reasons…. but meeting up with friends is the best. Mark and I talked at length about work-life balance as it relates to speakers. We talked about how, as speakers, we have a many choices about how hard to push our speaking business. The beautiful problem we face as entrepreneurs is that we have so many choices about where to take our business. Make new products? Develop more programs? Find and explore new niches? Experiment with branding? Cool. Sounds good to me. Sure, I have a few projects in the works, but having friend and mentor tell me that doing less is often the best choice really felt good. You’re to life balance, Mark!